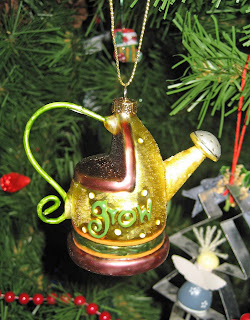 From the department of redundancy department, I have some more gardening themed ornaments to show everyone. But first, some useful information. Kathy of Cold Climate Gardening has posted some information on commenting with Open ID, which allows non-Blogger bloggers to leave a comment with a link back to their blog or website. Check that out and then feel free to experiment by leaving comments here, all you non-Blogger bloggers. I think it is important for all vegetables to be represented on your Christmas tree, including your root crops. You say po-ta-to, I say po-tah-to! 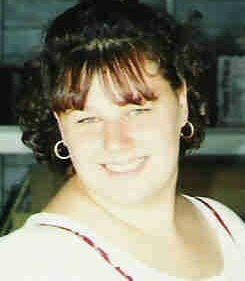 I believe that Colleen at In The Garden Online has this one, too. For some reason, our Target stores in different cities seemed to have some of these on clearance last year. How could these not be snatched up? I made this one years ago, can you tell? This bell doesn't ring. My sister has, or is supposed to have, a very special bell on her tree that does ring, but she thinks she lost it. She's in big trouble and had better find it. 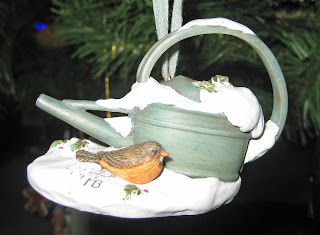 Did I mention I have several watering can ornaments? There's also one with a bunny and a watering can, but I couldn't find it this evening. Here's a watering can with a bird. This came from a popular greeting card company's line of Christmas ornaments. Hey, how did this one get in here!? 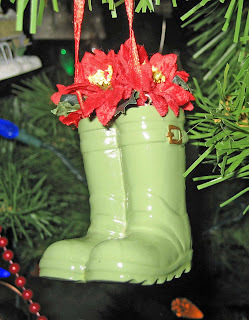 See, not every ornament on my tree relates to gardening. But many do. I try not to get distracted thinking about seeds until after the holidays. Then I think about them quite a lot. That's it for now. Like I said, feel free to test out Open ID here any time. 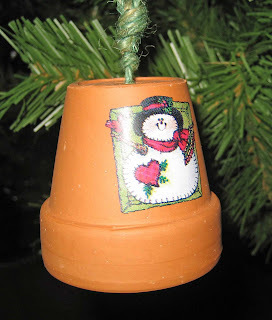 And I look forward to seeing other posts about garden-themed Christmas ornaments from other garden bloggers. That's exactly the ornament I have! I agree...how could they have sat there without being snatched by someone? I like the vegetable ornament. I haven't seen any of those around here. I wouldn't know whether to hang the one with the bird by the watering can on the garland with just birds or on the garden garland. Such decisions. I guess I don't have to worry about it because I don't have that one. I wish I did though. What fun to see your ornament collection, Carol. A friend just gave me two beautiful vegetable-themed glass ornaments: an onion and a head of broccoli. They're too pretty to have out only at Christmas! In addition to a lot of wildlife ornaments, I also have berries (strawberries and grapes) nuts and pinecones. And, of course, the terribly redundant Christmas tree ornament. I'm going to start looking around for more garden-y type ornaments. Thanks for the great idea! too funny! I was cleaning yesterday (a rare occurence) and was trying to dust a huge wreath in the living room that is up year round. There, lo and behold, tucked in among the grape vines, was the infamous Christmas Bell. 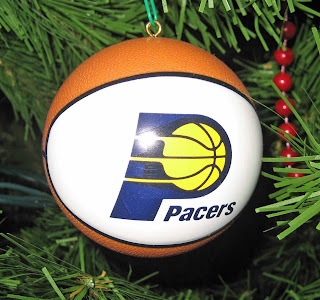 I didn't find it among the Christmas ornaments this year, because I never put it away last year. Love all your ornaments Carol. You have so many beautiful ones that you certainly dont' need a little insy teensy tiny bell! Personally, I think you siblings should take turns with that bell. Have the passing of the bell signal the end of the Christmas season. 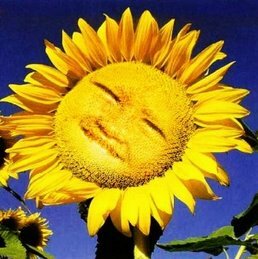 i tried the openid stuff that kathy posted about - no luck for me. In the course of doing my research for my OpenID post, I came across a lot of people saying it wasn't working right for them, so Bill's experience doesn't surprise me. Where did you ever find a potato oraament? Phillip... Thank you! I look forward to seeing your gardening-theme ornaments. Colleen...Yes, you need some fruits and vegetables, though with littles around you might want to leave the breakables in a box for awhile. go. I bet you could find it on eBay! Nan Ondra... I don't have brocolli or onion ornaments! But I have several other vegetables. Eleanor... Wonderful! Christmas is saved! OldRoses... Good luck in your search, as the garden-theme ornaments can sometimes be hard to find. But I bet you'll find some when you start looking. Sister with the Homestead... I have 12 of those litle bells, remember? 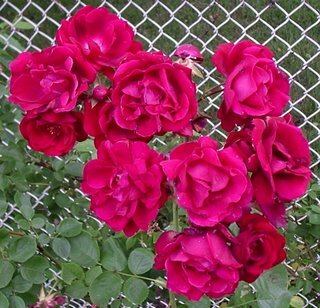 Cold Climate Gardening(Kathy)... That is a great idea. I'll take it next! Bill... I think Christmas trees reveal the personalities of the family, or at least they reveal a lot about one person in a family. Zoey... 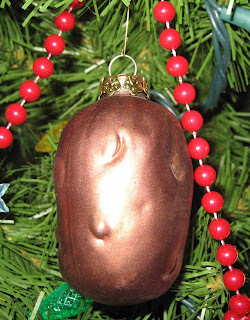 I got the potato ornament in a set of vegetable ornaments at Target about 15 years ago. I also have a carrot, a corn cob, a tomato, and a pea pod. And my sister got me an asparagus ornament when she was in Germany a few years ago. And I have two pickles and another 10 or so different fruits. These are just great (so were those in the earlier post!) I only have a couple of garden themed ornaments, but I'm really inspired by yours and others I've seen in my catching-up read tonight. I love the potato, especially! Only a few of the ornaments on our tree are "my" ornaments. Mine are mostly ones that were handed down from my mom. I could go for a couple of those cute watering can ornaments (but not 1 with a bunny). 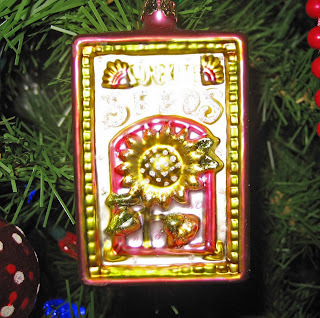 You inspired me to add my ornaments to my blog. Love that potato, but no rabbit ornaments!